Here is a film about spearfishing from 1944. This was filmed by the Sea-Net Manufacturing Company to promote their masks and fins. This is arguably the first diving manufacturer in the USA. I wonder if they eat the ray? I do know they are real tasty! Great video I lived in the Yucatan for a year I am sure that the water back in 1944 was a lot clearer than when I was there or today. John, I wish I could say I liked that one but, YIKES! Really cool gear though, and if you'll notice, at around 10:14, a Federale walks through the image. To very much agree with George, I hope they did eat that Ray, watching them haul that thing in at the end was hard to watch. Yes, Jaybird, watching some of those scenes was hard. But remember that in the beginning, even before scuba, we were spearfishing. 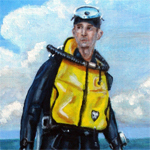 Cousteau and his friends started spearfishing to feed his family under German occupation. I started out spearfishing, and remember spearing a wolf eel (actually a wolf fish), bringing it home and it was so ugly that we buried it in our garden. The next year, Mom's rhubarb grew 7 foot long leaves. I found out later that the wolf fish was very good earpting, with solid, white meat from eating crabs. I remember Sitka Dave had a video of his buddy who fed a Wolf Eel, and then it became super friendly with them! I swear they named it Cuddles: it swam with them in the crook of his friends arm: it was an unbelievably-cute scene for such a fierce creature!!! I also remember the sound of Dave giggling like a school-girl through his regulator at depth. The whole thing was just plain sweet! 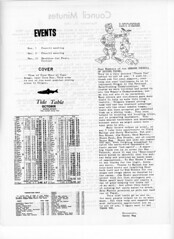 You cannot see much here, but the second page of this newsletter was devoted to spearfishing. 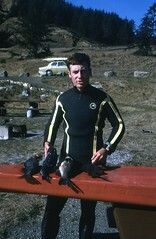 Me, with my catch circa about 1963. Apolonio Castillo was a Mexican competitive swimmer who competed in multiple swimming races during the 1948 Olympics. He did not win any medals, but he did come close. He later died in Acapulco in a cliff diving accident. Thank you for that bit of information. Many times, the people featured in these old films go un-noticed or not really appreciated. At least, this is a record of some of his exploits. I just re-watched this video, and from the descriptions, it seems that Apolonio Castillo was probably the better spearfisherman of the two, and probably taught the other diver, rather than the reverse shown in the film. Meanwhile, Pops Romano was trying to re-establish himself and the Sea-Net Manufacturing Company in Los Angeles. As you would expect, there were not many new members joining surfboarding or spearfishing clubs, so sales mainly focusedh on manufacturing Sea-Dive masks for a U.S. Navy contract he had received. He also continued with his main business of rope and wire rigging. Whenever possible, Frank (Rodecker) and Hal (Messinger) visited PopsRomano and, during 1944, Hal got to finish his promotional film, Underwater Spearfishing, Supreme Sports. The co-star ofthe film was Apolonio Castillo Diaz of Mexico, who was an Olympic champion swimmer who had formed a skin diving club in Acapulco, Mexica. The film was sponsored by Sea-Net Manufacturing Company, and a full-length version of it can be viewed by Googling "1944 Underwater Spearfishing film." 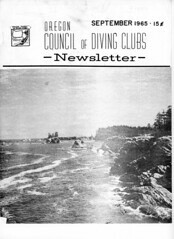 The uploaded film is courtesy of Historical Diving Society USA member and contributing writer for the Journal of Diving histor, Gary Pilecki. Which makes the stereotype even more offensive--that is seriously effed up!